Another stop on the inexorable slide towards the end of Disney 2D animation, Disney's Brother Bear had a luke warm critical reception and quiet box office. When the Japanese animation studios can produce films of such consistent sophistication, it's endlessly frustrating that Disney have just given up on cel animation in favour of CGI. Pixar films aren't great because they are CGI - although the artistry is immaculate (in fairness, Brother Bear does look splendid) - it's because they aren't sloppy and patronising, like this typically PC Disney effort. It's not that having a message (in this case, a vaguely anti-hunting, wildlife is good, happy clappy one) is a bad thing, but Disney are incapable of working these ideas in with any kind of subtlety. 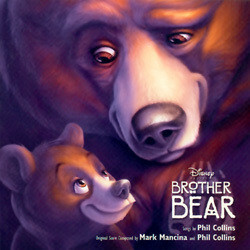 Although they have made various changes to their musical approach, Brother Bear moves back to the British pop star with Media Ventures composer combo that started with Elton John and Hans Zimmer on the Oscar winning The Lion King - a formula which worked with spectacular success and so, to Disney execs, one that must be flogged to death or until everyone is sick of it. Where Hans gets Elty, Mark Mancina gets Phil Collins. It worked on the modestly successful Tarzan and this is round two. Phil Collins' soft rock/pop song writing style and high pitched singing are something of an acquired taste; it's not that his songs are generic, they are too obviously by Collins for that, but there is a certain smoother over blandness. The mixture of close harmony and percussive arrangements are in largely in evidence throughout most of the slickly produced songs featured here. However, whereas his offerings for Tarzan managed to overcome the blandness and mediocre lyrics with some memorable and peppy tunes, Brother Bear has some exceptionally feeble lyrics and some distinctly forgettable tunes. No Way Out, the 'theme from Brother Bear' isn't bad, but hardly likely to stick in the mind for long and Welcome is let down by an outburst of especially inane word play. Fortunately, Tina Turner belts out Great Spirits with enough conviction that the results are one of the few real keepers on the album. Several of the songs have two (generally unnecessary) versions, but the greatest difference is between the two Transformations; the first a clear riff on Karl Jenkin's Adiemus albums, the second a generic Collins arrangement. Fortunately for film score fans, the twenty minutes afforded to Mark Mancina's contribution are well worth hearing. Fragments of the song melodies appears here and there, notably Transformation wafts in and out of Awakes as a Bear, often much more affectingly than the original arrangements. Mancina's Native Americanisms are pleasantly subtle and his orchestral writing is stronger here than for Tarzan, with plenty of fine moments both dramatic and subtle. Perhaps the biggest disappointment is the brevity of many passages, a little more space for the ideas to breathe would have been most welcome. Still, the splendid mixture of action and the gorgeous finale in Wilderness of Danger and Beauty leaves a much stronger impression than the album as a whole should do. A difficult disc to recommend either way; the Collins songs aren't that awful, just not sufficiently diverse or memorable and hampered by poor lyrics, while score fans will want more of Mancina's music. However, an album that is likely to turn up for cheap readily enough. A suggestion for future Disney music: songs by Ben Folds, score by Elliot Goldenthal. Rock on.